defined by the four C’s: continuity, consistency, cohesion, camaraderie. But, the Seahawks get by most of the time with just one C: Cable. That’s why there’s no reason to be worried about Seattle’s offensive line — despite the uncertainty at center and left guard this year and left tackle and right guard next year. As always, Tom Cable will hook it up. As we have pointed out many times here and in other forums, the Seahawks have not started the same five linemen all season since 2007 — Mike Holmgren’s last playoff year. Under Pete Carroll, the Hawks have averaged seven different starting lineups per season. That translates to 23 starters over five years — reportedly just two fewer than the league-high 25 used by the Colts and Chargers. 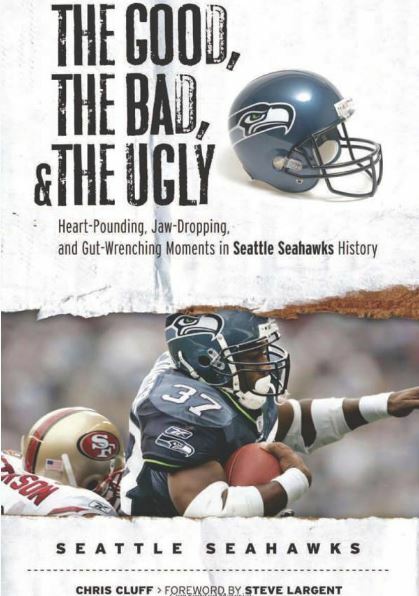 The lack of the four C’s on the line was a big reason the Hawks were so bad from 2008 to 2011 (23-41 record, average of 1,628 rushing yards per season). 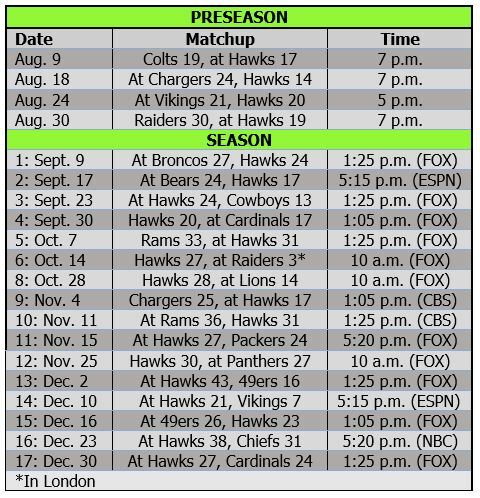 Cable arrived in 2011, and the Hawks finally got the running game going toward the end of that season. Russell Wilson arrived in 2012, and they have set the team record for rushing yards twice in the past three years despite their ongoing inability to find five guys with the right combination of talent and fortitude to play together for a full season. The Hawks have had as much chaos up front as ever in the past two years, and they still have won two Super Bowls (oh, right, SHOULD HAVE WON two Super Bowls). They started two rookies for half of the 2013 season and still went 13-3 and won Super Bowl XLVIII. Last season, rookie Justin Britt started at right tackle, Alvin Bailey started five times, and the Hawks used four centers; and they still set a team record with 2,762 rushing yards and were in perfect position to win Super Bowl XLIX. It’s not like the Hawks have not tried to create stability up front. Carroll and John Schneider have drafted 12 linemen, but only left tackle Russell Okung, right guard J.R. Sweezy, Britt and rookies Mark Glowinski, Terry Poole and Kristjan Sokoli remain. Despite that lackluster success rate, the Hawks actually enter this season in better shape up front than they have been at any point under Carroll and Cable. They lost two nominal starters (Max Unger and James Carpenter), but they have some measure of continuity, with Okung, Sweezy and Britt returning, third-year vet Bailey leading the competition at left guard and veteran Lemuel Jeanpierre battling Drew Nowak at center. Also in the mix are second-year tackle Garry Gilliam, center Patrick Lewis and Poole, who has moved from guard to right tackle as the Hawks try to find his fit in their system. Cable said Okung is having the best camp of his career — fitting because the former first-round pick has a lot to prove in his contract year. 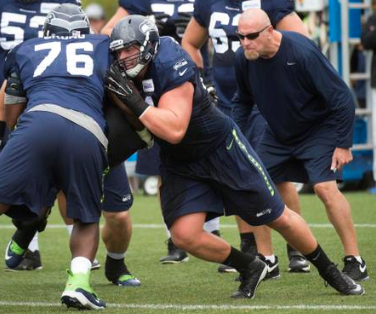 As much as Cable loves Sweezy, you have to think the Hawks want to re-sign the right guard. The fact that they moved Glowinski to left guard also might hint at that desire. Of course, some of his “grinders” are converted D-linemen, which means it will take a little longer. But, as Nowak said, Cable makes it easy to learn. Carroll echoed that about all of the young linemen. That’s what camp and preseason are for, of course. And there certainly is no reason to worry about the unsettled center and left guard spots. When it’s all said and done, Cable will plug in the guys he prefers. It won’t really matter who starts, though, because the Hawks surely will end up rotating through six or seven starting combinations — as they always do. 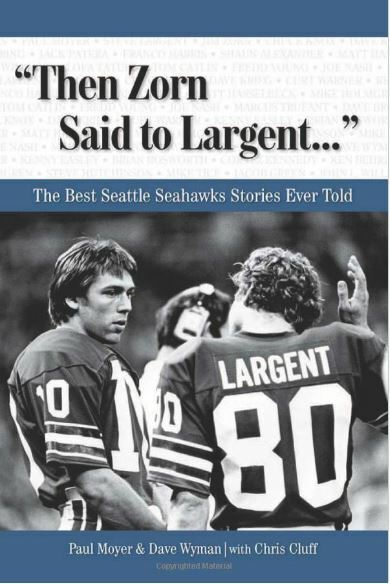 And, as usual, the Seahawks will succeed without the four C’s because they have the one C they really need: Cable.